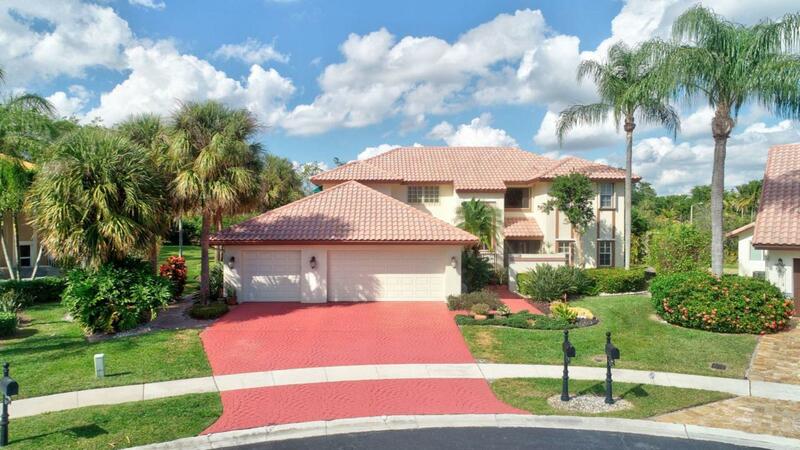 Looking for a large home in a perfect cul-de-sac location with an exceptionally large lot in a beloved family community?Are you looking for a gated community in Boca Raton's Best School District? This home will meet all your family's needs with 11 rooms including 5 bdrms-2 on 1st flr),a Rec.Room, Formal living areas & a large kitchen with a b'fast room, bar & open to Fam. room. This home has 3 full baths (2 recently renovated), new W/D, covered patios& a terrace off the master with beautiful views of the lake. 3 car garage plus parking for 3 addl.cars. Massive ''pie-shaped'' lot of 10,454 sq. ft. providing max privacy & tons of room for a pool. 3 way split for BDS.Hurricane protection ALL windows. La Joya is a quiet & highly revered community w/ Pool, Clubhouse 7 Tennis.Call 2 show todlarge pool, tennis and clubhouse just steps from your door. This home has a young roof, plantation shutters, central vacuum, and great floor plan for ease of living & privacy. It has beautiful, mature landscaping and the lawn sprinklers are fed from the lake. Inquire soon and set up an appointment to view this home.